The SEC is regarded as one of the most accomplished sports conferences in terms of its winning reputation, with 43 national football championships, 21 basketball championships, 41 indoor track championships, 42 outdoor track championships, 24 swimming championships, and 20 gymnastics championships. The conference is also highly successful financially, as it consistently leads most others in revenue distribution to its members, including an SEC record $455.8 million for the 2014–15 fiscal year, which was a sizable increase over the $292.8 million for the 2013–14 fiscal year, largely due to the revenue from the introduction of the SEC Network. The SEC consists of 14 member institutions located within the borders of 11 contiguous states. Listed in alphabetical order, these 11 states within the SEC's geographical footprint are Alabama, Arkansas, Florida, Georgia, Kentucky, Louisiana, Mississippi, Missouri, South Carolina, Tennessee, and Texas. The geographic domain of the conference is predominantly within the Southeastern and Southern United States, and stretches from Texas in the west to South Carolina in the east and from Missouri in the north to Florida in the south. The SEC is divided into East and West Divisions, although the divisional alignment is not strictly geographic, with Missouri in the East Division while being further west than several West Division schools, and Auburn in the West Division despite being located further east than East Division schools Missouri and Vanderbilt. These divisional groupings are applied only in football and baseball, for both scheduling and standings purposes. In football, the two division winners meet in the SEC Championship Game. Since July 1, 2012, there are 14 members, with Vanderbilt being the only private institution. ^ Enrollment figures include both undergraduate and graduate students. ^ During the 2017–18 school year, Tennessee once again allowed all of its women's sports teams to use the traditional women's nickname of "Lady Volunteers" if they wished, reversing a change made in 2015 that saw only the women's basketball team retain "Lady Volunteers". ^ LSU uses the "Lady Tigers" nickname in women's sports that also have men's teams. Teams in sports that are only sponsored for women use "Tigers". It was not until 1966 that African Americans first participated in an SEC athletic contest, and the first black scholarship athletes did not play in the SEC until the 1967–68 school year. The first African American to compete in the SEC was Stephen Martin, who walked on to the Tulane baseball team in that school's final SEC season of 1966. In August of that same year, Kentucky enrolled Nate Northington and Greg Page on football scholarships, and Vanderbilt enrolled Godfrey Dillard and Perry Wallace on basketball scholarships. At the time, the NCAA did not allow freshmen to compete on varsity teams, which meant that these pioneers could not play until 1967. Page died from complications of a spinal cord injury suffered during a football practice before ever playing a game, while Dillard suffered a career-altering injury before getting a chance to play for Vanderbilt's varsity and transferred to Eastern Michigan. The remaining two both played in the 1967–68 school year. Northington made his overall debut against Indiana on September 23, 1967 and his SEC debut against Ole Miss the following week on September 30 (the day after Page's death), while Wallace made his varsity debut later that year. Following expansion, the SEC was the first conference to receive permission from the NCAA to sponsor an annual football championship game that did not count against NCAA limits on regular-season contests, featuring the winners of the conference's Eastern and Western divisions. The 1992 and 1993 championship games were held at Legion Field in Birmingham, and all championship games from 1994 onward have been held in Atlanta—first at the Georgia Dome until its closure and demolition after the 2016 season, and since 2017 at Mercedes-Benz Stadium. Four SEC institutions are members of the prestigious Association of American Universities: Florida, Missouri, Texas A&M and Vanderbilt. Prior to the addition of Missouri and Texas A&M from the Big 12, the SEC had the fewest AAU members among Power Five conferences. The Big 12 Conference had seven AAU members through the 2010–11 school year, but four of these schools left the conference in 2011 and 2012—Nebraska for the Big Ten in 2011, Colorado for the Pac-12 in 2012, and Missouri and Texas A&M for the SEC in 2012, leaving that conference with three AAU members. ^ Two games played each year at War Memorial Stadium in Little Rock, one non-conference game and one SEC game. ^ One men's home game per year played at Freedom Hall in Louisville. ^ Memorial Coliseum is used exclusively for women's basketball. ^ Dudy Noble Field's official seating capacity is 7,200, but its total capacity is 15,500, which includes privately owned seating in Left Field Lounge. Mississippi State holds the all-time NCAA on-campus record for one day attendance at 14,991. ^ Rifle is technically a men's sport, but men's, women's, and coed teams all compete against each other. Kentucky has a coed team, and Ole Miss has a women's team. For the most recent season, see 2018 Southeastern Conference football season. SEC teams did not play a uniform number of conference games until 1974. Prior to that, the number of conference games teams played ranged from 4 to 8, but most played a 6 or 7 game schedule. The league adopted a uniform 6 game schedule from 1974 to 1987, and added a 7th conference game from 1988 to 1991. Through this period and through the earlier years each SEC school had 5 permanent opponents, developing some traditional rivalries between schools, and the other games rotated around the other members of the conference. The following table shows the current permanent inter-divisional opponent for each school listed by total number of games played (records through week 11 of the 2015 season with West Division wins listed first). Through end of the 2017 season. Records reflect official NCAA results, including any forfeits or win vacating. Two former members have also won conference titles, Georgia Tech with 5 and Tulane with 3. The SEC Championship Game pits the SEC Western Division representative against the Eastern Division representative in a game held after the regular season has been completed. The first two SEC Championship football games were held at Legion Field in Birmingham, Alabama. Since 1994, it has been played in Atlanta—first at the Georgia Dome through 2016, and since 2017 at its replacement, Mercedes-Benz Stadium, with the current hosting contract running through 2027. The "home team" designation alternates between the division champions, going to the East champion in even-numbered years and the West champion in odd-numbered years. As of 2017, the West division leads in overall wins in the championship game against the East division, 14 to 12. ‡ The Big Ten and ACC will switch between the Music City and Gator bowls on alternating years. ^ Trophy first awarded in 1996. ^ Series was annual rivalry when Arkansas and Texas A&M were both in the Southwest Conference. The teams began playing annually at Cowboys Stadium starting in 2009; beginning in 2012 the series became a conference matchup and reverted to a home-and-home for 2012 and 2013, then returned to Cowboys Stadium in 2014 and beyond. ^ The series does not have an official nickname (the unofficial nickname is due to both teams sharing the same mascot name), though some individual games do. Not an annual rivalry until Auburn and LSU were placed in the SEC West in 1992. ^ Played in Jacksonville, Florida since 1933, with only two exceptions due to stadium construction. Formerly known as the "World's Largest Outdoor Cocktail Party," though the SEC and schools now discourage the use of the term due to the issue of excessive alcohol use. ^ Starting in 1925, the trophy of this game was an orange, white, and blue beer barrel. However, this practice was discontinued in 1999 following a fatal alcohol-related car crash involving two Kentucky football players. ^ Series was annual rivalry when Arkansas and Texas were both in the Southwest Conference. The teams have played only three times in the regular season since Arkansas joined the SEC, as well as two meetings in bowl games. ^ Met annually from 1944 to 1987, but now played only intermittently. ^ From 1987 to 1999, the trophy of this game was a red, white, and blue bourbon barrel, but this practice was discontinued in 1999 following a DUI accident that killed two Kentucky football players. ^ Whereabouts of the original rag are unknown; a new rag was presented to LSU after victories in 2001 and 2006. Series was only contested twice from 1995 through 2005, but a 10-year contract began in 2006. For the current season, see 2018–19 Southeastern Conference men's basketball season. Since the 2012–13 season, SEC teams have played an 18-game conference schedule, which includes two games (home and away) against each of three permanent rivals and single games against the remaining 12 teams in the conference. Men's basketball formerly used the East/West divisional alignment for regular-season scheduling and seeding the conference tournament, but it no longer does. Before expansion to 14 teams, the conference schedule was 16 games. Although the divisions were eliminated beginning with the 2011–12 season, that season's schedule was still set according to the divisional alignments, with each team facing each team from its own division twice and each team from the opposite division once. As part of the proposal by SEC head coaches that led to the scrapping of the divisional structure, a task force of four coaches and four athletic directors was set to discuss future conference scheduling. At that time, options included a revamped 16-game schedule, an 18-game schedule, or a full double round-robin of 22 conference games. 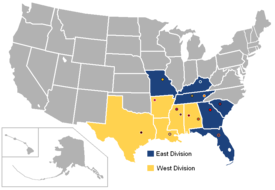 However, these discussions came before Texas A&M and Missouri were announced in late 2011 as incoming members for the 2012–13 season, which required a format that could support 14 teams rather than 12. The 2014 SEC spring meetings saw a further change to the scheduling format. While the athletic directors voted to stay with an 18-game conference schedule, they increased the number of permanent opponents for each school from one to three. Each school retained its permanent opponent from the 2012–2014 period while adding two others. From 1966-67, following Tulane's departure, through 1990-91, the year prior to the addition of Arkansas and South Carolina, teams played a double round-robin, 18-game conference schedule. No team was undefeated in this period, though three teams went 17–1 (Kentucky in 1970 and 1986, LSU in 1981). During the period from 1992 to 2012 when the league slate was 16 games, Kentucky went undefeated in SEC play in 1996, 2003, and 2012 (although only the 2003 team went on to win the conference tournament). The table below lists each school's permanent men's basketball only scheduling partners beginning in 2014-15. As of the most recently completed 2017–18 season, the tournament has most often been held at two venues that have each hosted 12 times. Louisville Gardens in Louisville, Kentucky served as the regular host from 1941 until the tournament was discontinued after the 1952 edition. The Georgia Dome in Atlanta first hosted the tournament in 1995 and most recently hosted in 2014. Bridgestone Arena in Nashville, Tennessee is now the regular host, with that venue hosting the tournament from 2015 through 2025, except in 2018 and 2022 (years in which it will instead host the SEC women's basketball tournament). Sometimes, the tournament will take place at the Smoothie King Center in New Orleans, or Amalie Arena in Tampa, Florida. The 2018 tournament was held at Scottrade Center, now Enterprise Center, in St. Louis, Missouri, and the 2022 tournament will be at Amalie Arena. Since 1990, the SEC has become the most successful conference on the college baseball diamond. That year, Georgia captured the conference's first national championship at the College World Series. Following that, LSU won 6 of the next 19 titles, including 5 of 10 between 1991 and 2000 and its sixth title in 2009. This was followed by South Carolina winning back to back titles in 2010 and 2011, Vanderbilt winning its first title in 2014, and Florida winning its first title in 2017. During that same span, nine teams have also been runners-up at the CWS. The CWS final series has featured two SEC teams in 1997, 2011, and 2017. The only current SEC member that has never appeared in the CWS is Kentucky. Among other current SEC members, only Missouri has not appeared in the CWS while a member of the SEC (and has yet to make the NCAA tournament as an SEC member), although it made six CWS appearances in the 1950s and 1960s while in the Big Eight Conference. Both Georgia Tech and Tulane have made appearances in the CWS after leaving the SEC. SEC presidents and athletic directors voted to expand the SEC Tournament to 10 teams starting in 2012. The division winners received a bye on the first day of competition, and the tournament became single-elimination after the field is pared to four teams. With the addition of Missouri and Texas A&M for the 2013 baseball season, the tournament was expanded to 12 teams. The top four seeds receive a bye on the first day, with seeds 5-12 playing single elimination. The tournament is double-elimination for the next three days, then reverts to single elimination when four teams are remaining. In addition to the winner of the SEC Baseball Tournament, the Southeastern Conference usually gets several at-large bids to the NCAA Tournament. Many teams have qualified for the NCAA Tournament despite failing to win a game in the SEC Tournament. One of those, Mississippi State, went 0-2 in the 2007 SEC Tournament, but reached the College World Series in 2007. The recent history of SEC women's basketball is dominated by Tennessee, who have won regular season and/or conference tournament championships in 25 of the last 31 seasons, as well as 8 national championships since 1987. In the 28 seasons the NCAA Division I Women's Basketball Championship has been held, SEC schools have reached the Final Four 32 times, more than twice as often as any other conference. The Lady Vols have historically been one of the nation's dominant programs in that sport. Starting in the mid-1990s, UConn has emerged as Tennessee's main rival for national prominence. The Huskies won four national titles between 2000 and 2004; in three of those years, their opponent in the NCAA final was Tennessee. Connecticut also defeated Tennessee in the 1995 Championship game, the Huskies' first-ever title. The Naismith Memorial Basketball Hall of Fame brokered a deal that will see the teams renew their rivalry with a home-and-home series in 2020 and 2021. One of the youngest rivalries featuring an SEC team, the Tigers and Texas Longhorns are the two most successful swimming and diving programs in the country. The two have combined for 17 NCAA National Titles since 1981 (9 for Texas, 8 for Auburn) and between 1999 and 2007 won every national title awarded. The two regularly face off in a meet during the regular season, Auburn's men own a 12–9 record over the Longhorns. The women just recently began an annual series, with the Tigers winning the series so far 3–1. Texas was the only team to beat the Auburn men between 2001 and 2007. ^ "Official Site of the Southeastern Conference". Secsports.com. Archived from the original on August 6, 2010. ^ "SEC generates $455 million in revenue, $31.2M per school; Slive's run ends". ^ "2013–2014 SEC Revenue Distribution". Southeastern Conference. June 5, 2010. Retrieved June 6, 2010. ^ "Alabama and Auburn to the East? Missouri and Vanderbilt to the West?". ^ Wheeler, Romney (December 13, 1940). "Sewanee quits Southeastern". The Tuscaloosa News. Associated Press. p. 1. Retrieved April 14, 2012 – via Google News Archives. ^ Nunez, Tammy (May 15, 2013). "Tulane community mourns death of SEC pioneer Stephen Martin". The Times-Picayune. Retrieved July 13, 2013. ^ a b c Story, Mark (September 22, 2016). "UK reveals sculpture honoring first black football players". Lexington Herald-Leader. Retrieved October 3, 2016. ^ a b Carey, Jack (February 19, 2004). "An SEC trailblazer gets his due". USA Today. Retrieved March 7, 2010. ^ Maraniss, Andrew (2014). Strong Inside: Perry Wallace and the Collision of Race and Sports in the South. Nashville, TN: Vanderbilt University Press. p. 221. ISBN 9780826520241. ^ a b c "About the Southeastern Conference". Secsports.com. Archived from the original on March 17, 2009. ^ "Texas A&M To Join Southeastern Conference", SECSports.com (September 25, 2011). Retrieved September 25, 2011. ^ "University Of Missouri To Join Southeastern Conference". Retrieved November 6, 2011. ^ Segrest, Doug (December 28, 2011). "SEC unveils 2012 schedules: Newcomers Missouri, Texas A&M get splashy home debuts". The Birmingham News. Retrieved December 28, 2011. ^ "SEC rolls out division-based schedule". ESPN. Associated Press. December 28, 2011. Retrieved December 28, 2011. ^ "SEC releases schedule with Missouri and Texas A&M". Sporting News. December 28, 2011. Retrieved December 28, 2011. ^ "Stories of Character :: Celebrating 75 Years". Secsports.com. Archived from the original on October 22, 2007. ^ "Southeastern Conference Creates Consortium to Strengthen Academic Programs at SEC Institutions" (PDF). SEC Digital Network. Retrieved February 14, 2013. ^ "SEC pushing academic oomph". MrSEC.com. Archived from the original on December 24, 2013. Retrieved December 21, 2013. ^ "Dr. Zeppos interview". SEC Network. Retrieved December 21, 2013. ^ "About SECU" (PDF). SEC Digital Network. Retrieved September 1, 2013. ^ "SECU Programs" (PDF). SECNetwork. Retrieved September 1, 2013. ^ "Southeastern Conference Academic Initiatives" (PDF). Southeastern Conference. Retrieved October 23, 2018. ^ a b "NCAA FINANCES". USA Today. Retrieved June 27, 2018. ^ a b c "Alabama Athletics Facilities". University of Alabama. Retrieved August 19, 2017. ^ a b c "Arkansas Razorback Facilities". University of Arkansas. Archived from the original on August 9, 2017. Retrieved August 19, 2017. ^ "Jordan_Hare Stadium". University of Auburn. Retrieved August 19, 2017. ^ "Auburn Arena". University of Auburn. Retrieved August 19, 2017. ^ "Plainsman Park". University of Auburn. Retrieved August 19, 2017. ^ a b c "Florida Gators Facilities". University Athletic Assoc., Inc. Retrieved August 19, 2017. ^ "Sanford Stadium". University of Georgia Athletics. Retrieved August 19, 2017. ^ "Stegeman Coliseum". University of Georgia Athletics. Retrieved August 19, 2017. ^ "Foley Field". University of Georgia Athletics. Retrieved August 19, 2017. ^ "2017 Kentucky Wildcats Media Guide" (PDF). UK Athletics. Retrieved August 19, 2017. ^ "Rupp Arena". UK Athletics. Retrieved August 19, 2017. ^ "Memorial Coliseum". UK Athletics. Retrieved August 19, 2017. ^ "Kentucky Proud Park". UK Athletics. Retrieved November 2, 2018. ^ "LSU's Tiger Stadium". LSU Athletics, Louisiana State University. Retrieved August 8, 2017. ^ "Pete Maravich Assembly Center". LSU Athletics, Louisiana State University. Retrieved August 8, 2017. ^ "Alex Box Stadium, Skip Bertman Field". LSU Athletics, Louisiana State University. Retrieved August 8, 2017. ^ a b c "Ole Miss Facilities". CBSi Advanced Media. Retrieved August 19, 2017. ^ a b "Mississippi State Athletic Facilities". Mississippi State University Athletics. Archived from the original on August 19, 2017. Retrieved August 19, 2017. ^ "Mississippi State Athletic Facilities". Mississippi State University Athletics. Archived from the original on August 19, 2017. Retrieved August 19, 2017. ^ "SouthernCollegeSports.com". SouthernCollegeSports.com. February 2, 2006. ^ a b c "Mizzou Facilities". University of Missouri. Retrieved August 19, 2017. ^ a b c "South Carolina Facilities". CBSi Advanced Media. Retrieved August 19, 2017. ^ a b c "University of Tennessee Facilities". University of Tennessee Athletics. Retrieved August 19, 2017. ^ "Kyle Field". Texas A&M University. Retrieved August 19, 2017. ^ "Reed Arena". Texas A&M University. Retrieved August 19, 2017. ^ "Blue Bell Park". Texas A&M University. Retrieved August 19, 2017. ^ a b c "Vanderbilt Facilities". CBS Interactive. Retrieved August 19, 2017. ^ "Official Site of the Southeastern Conference". Secdigitalnetwork.com. Retrieved September 8, 2013. ^ "Title IX". insidehighered. Retrieved January 15, 2015. ^ Under NCAA Bylaw 20.9.4, all Division I schools are required to sponsor a minimum of seven men's and seven women's sports, or six men's and eight women's sports. Bylaw 20.9.7.1 imposes the latter requirement on FBS schools. FCS schools, under Bylaw 20.9.8.1, may use either requirement. Note that this does not explicitly require that a school sponsor two more women's sports than men's sports. See "2012–13 NCAA Division I Manual" (PDF). NCAA. Retrieved January 7, 2013. ^ Southeastern Conference, 2018–19 SEC Championships – Full Schedule, SECSports.com. Retrieved November 4, 2018. ^ Kleinpeter, Jim (April 27, 2014). "LSU AD Joe Alleva blasts SEC decision on permanent cross-division foes in football". The Times-Picayune. New Orleans. Retrieved April 27, 2014. ^ a b "SEC Announces Format For Future Conference Schedules" (Press release). Southeastern Conference. April 27, 2014. Retrieved April 27, 2014. ^ Bromberg, Nick (April 27, 2014). "SEC to continue eight-game conference schedule". Dr. Saturday. Yahoo! Sports. Retrieved April 27, 2014. ^ Wilmer, Brian (March 19, 2015). "SEC Adjusts Power 5 Scheduling Requirements". FB Schedules. Retrieved March 20, 2015. ^ "NCAA Football : Series records". mcubed.net. Retrieved November 10, 2015. ^ "Auburn-Georgia series record". Mcubed.net. ^ "Alabama-Tennessee series record". Mcubed.net. ^ "Ole Miss-Vanderbilt series record". Mcubed.net. ^ "LSU-Florida series record". Mcubed.net. ^ "Mississippi St.-Kentucky series record". Mcubed.net. ^ "Arkansas-Missouri series record". Mcubed.net. ^ "Texas A&M-South Carolina series record". Mcubed.net. ^ College Football Data Warehouse, All-time Division I-A football records Archived April 6, 2004, at the Wayback Machine. Retrieved June 16, 2012. ^ "SEC Announces Agreements with Nine Bowl Games". secdigitalnetwork.com. Retrieved May 31, 2014. ^ "The Money Behind the College Football Playoff Bowl Games – US News". U.S. News & World Report LP. Retrieved November 2, 2015. ^ "College Football Bowl Schedule". College Football Poll. Retrieved November 2, 2015. ^ "SEC bowl game payouts keep getting bigger and bigger". December 9, 2015. ^ "2015 NCAA football head coach salaries methodology USA TODAY Sports". USA Today. October 8, 2015. Retrieved November 3, 2015. ^ "NCAAF Coaches Salaries USA TODAY Sports". USA Today. Retrieved November 3, 2015. ^ Vanderbilt University – Form 990 (PDF) (Report). GuideStar. 2014. p. 15. Retrieved November 12, 2016. ^ "Destin Recap: Day Two" (Press release). Southeastern Conference. June 1, 2011. Retrieved June 3, 2011. ^ "SEC Men's Basketball Schedule/Tournament Formats" (Press release). Southeastern Conference. June 4, 2012. Retrieved June 5, 2012. ^ "SEC Spring Meetings – Tuesday Notebook" (Press release). Southeastern Conference. May 27, 2014. Retrieved May 28, 2014. ^ "Through the Years: SEC Champions" (PDF). 2012–13 SEC Men's Basketball Media Guide. Southeastern Conference. p. 67. Retrieved May 16, 2013. Since 1951, when the round-robin schedule was introduced, the title has been decided by a winning percentage on the conference schedule. ^ "Nashville To Host SEC Basketball Tournaments" (Press release). Southeastern Conference. October 15, 2013. Retrieved October 27, 2013. ^ "St. Louis, Tampa to play SEC hosts". ESPN.com. Associated Press. May 27, 2014. Retrieved May 28, 2014. ^ Traub, Seth (November 17, 2000). "As Strong As Ever". CNNSI.com. Archived from the original on June 4, 2011. ^ Minichino, Adam (March 3, 2010). "SEC women's schedule affects seedings for tournament". The Starkville Dispatch. Retrieved March 4, 2010. ^ "UK Hoops Announces 2009–10 Schedule" (Press release). University of Kentucky Athletics. August 24, 2009. Archived from the original on April 6, 2012. Retrieved June 16, 2011. The system increased the existing 14-game schedule by adding another rotating team from the East and West divisions. Kentucky's permanent partner is South Carolina and for the next two seasons, UK will face Auburn and Arkansas as their Western home-and-home opponent (sic). The Wildcats' Eastern Division partners are Georgia and Vanderbilt. ^ "SEC Spring Meetings Notes" (Press release). Southeastern Conference. June 1, 2012. Retrieved June 5, 2012. ^ "The SEC". Southeastern Conference. Archived from the original on September 26, 2009. Retrieved March 4, 2010. ^ "Championships: SEC Champions" (PDF). 2012–13 SEC Women's Basketball Media Guide. Southeastern Conference. p. 88. Retrieved May 16, 2013. From 1980 to 1985, the SEC champion was the winner of the SEC Tournament. Since 1986, the SEC champion has been determined by the regular season schedule. ^ "Auburn Men's Swimming And Diving Falls To No. 1 Texas, Snapping 44-Dual Meet Win Streak". Auburn University Athletics. Retrieved May 26, 2009. ^ "NCAA Men's Championships" (PDF). Archived from the original (PDF) on February 5, 2009. Retrieved June 3, 2009. ^ NCAA.org, Division I Championships, Summary. Retrieved June 17, 2011. ^ "Official Site of the Southeastern Conference". Secsports.com. Archived from the original on July 26, 2009. ^ Michael Smith & John Ourand, "ESPN pays $2.25B for SEC rights", Sports Business Journal (August 25, 2008). Retrieved February 14, 2010. ^ "CBS Sports TV Schedule". CBSSports.com. June 11, 2008. ^ "Official Site of the Southeastern Conference". Secsports.com. Archived from the original on August 14, 2009. ^ "Official Site of the Southeastern Conference". Secsports.com. ^ "SEC considering starting own TV network – wkyt.com". Archived from the original on August 18, 2016. ^ "www.secspors.com - ESPN, SEC Reach Unprecedented 15-Year Agreement". Secsports.com. Archived from the original on August 29, 2008. ^ "SEC And ESPN Announce New TV Network > SEC > NEWS". Secdigitalnetwork.com. February 5, 2013. Retrieved September 8, 2013. ^ "SEC Releases 2014 Conference Football Schedule > SEC > NEWS". Secdigitalnetwork.com. August 21, 2013. Retrieved September 8, 2013.